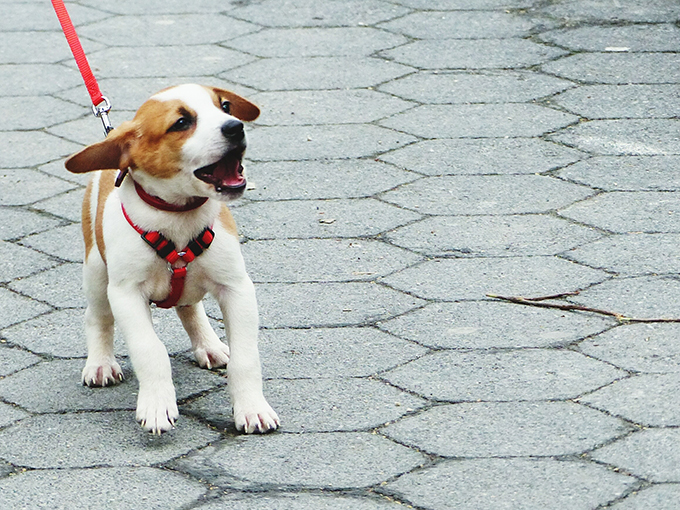 When it comes to leash training your dog, there’s more to it than meets the eye. 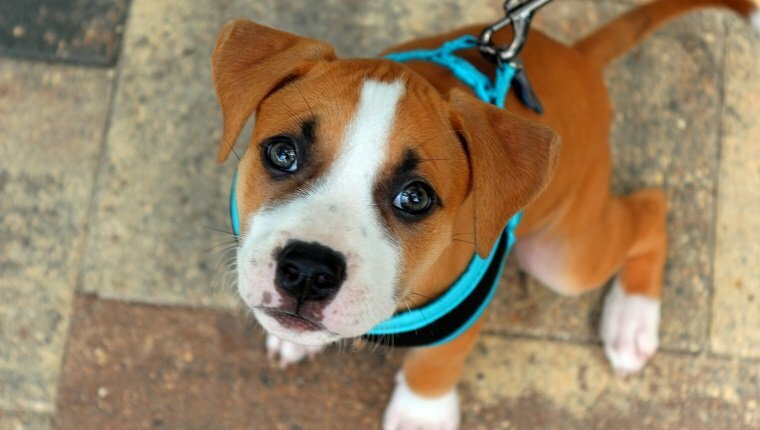 Puppies aren’t born knowing how to walk on a leash, and new owners need to work with their puppies–or even full-grown, adopted dogs–to make sure they are safe and obedient on their walks. 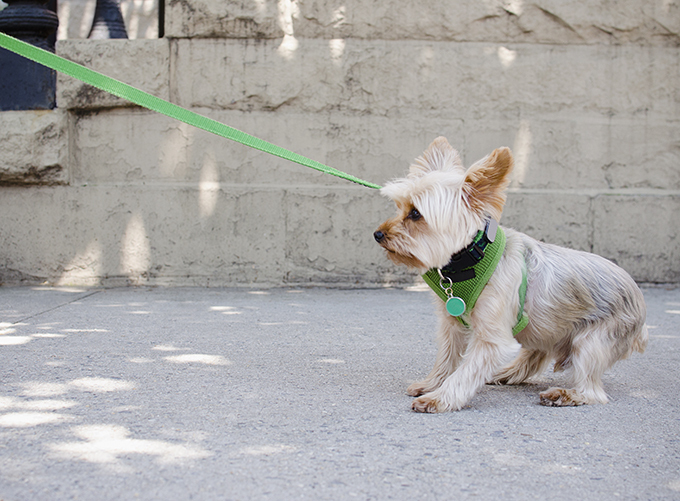 Does your dog pull or yank on their leash any time they see another dog? Do you have a puppy that refuses to budge once you get their harness on? Training good leash behavior can be demanding, mainly because most dogs get overly excited about going on walks, and once on the walk, they feel free to put their priorities above yours. Some dogs may be set on getting to their destination, like the dog park, and want to get where they’re going as fast as possible. Others see walks as leisurely shopping trips and want to stop at every bush or pole, sniff at every little spot, or check out every object in their path. Here is everything you need to know if you are leash training, whether you’re teaching a puppy how to properly walk while leashed or revisiting some leash walking skills with an older dog. When you first put a leash and collar on your puppy, they may refuse to move an inch. If you try to put on a collar or harness and go for a walk right away, chances are good that they will resist. 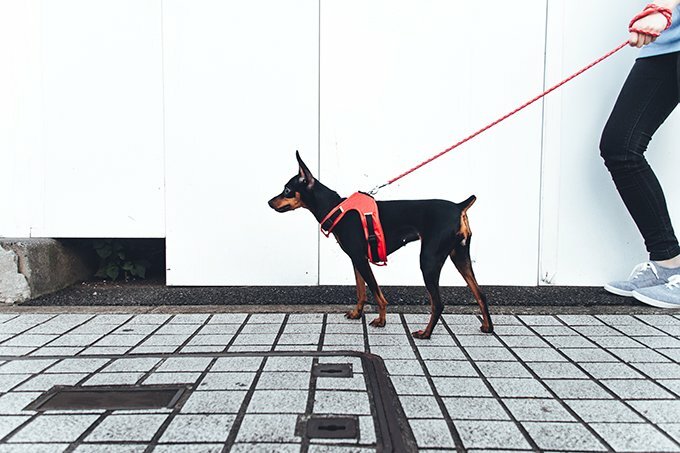 In order to get your pup used to their harness or collar, have them wear it around the house before even attempting to take her on an actual walk. Once they get accustomed to the harness, try putting the leash on and let them walk on their own for a bit. Do this for short amounts of time and make it fun! Give your puppy treats and affection, showing them that when they wear the harness and leash, it’s going to be a pleasant experience. To prevent your puppy from yanking, barking, or stopping dead in their tracks while on a leashed walk, teach them a cue, such as a click from a clicker, a word (not his name, though! ), or some other auditory signal. When your puppy looks at you, give them a reward or treat. Eventually, your puppy will come to you after hearing their “go” word or signal, expecting a reward. This will help keep your dog’s attention and focus on you once you go out around the block and encounter possible distractions. After your dog is trained to respond to your cue, take them out for a walk. Your puppy may be overstimulated with the amount of smells, noises, and other animals. If your pup sees another dog and lunges or barks, give your signal, and once your dog responds and stops the unwanted behavior, give them a reward or treat. Do this repeatedly until they expect a treat every time while walking outside. Then, only give your dog a treat intermittently. Dogs respond best to unpredictable reinforcement once they are trained. This will keep behavior in check as you go on more and more walks. If you have tried these training tips so far and still find yourself at a loss, don’t lose hope. There are some reasons why your dog may still be overly excited on walks, stubborn, or unresponsive to your commands. For some dogs, the reason why they are still super hyper is because they have an excess amount of energy. Dogs–and puppies especially–need a lot of structured playtime to burn off some of that energy. If you are having issues with leash-pulling and aggression, try playing with your dog for 15 to 20 minutes before going for a walk. This will tire them out a bit, and they are less likely to cause issues while leashed. It’s no secret that dogs like to sniff around before doing their business. If you find that your dog likes to take their sweet time sniffing and finding the perfect spot, try walking at a brisker pace. A faster walking pace will help set the tone for the walk as a whole, and dogs are less likely to take as many stops if they are moving quickly. When your dog does inevitably stop to find a place to relieve themselves, limit the sniffing time to 30 seconds or less. Once your dog has hit that time, use a cue like “hurry up!” or “let’s go!” and reward them with a treat when they continue walking. You can give the leash a light tug along with the cue to help get your dog moving. The tug should only be strong enough to get their attention and let them know to get going. It should not cause discomfort. Some dogs and puppies go berserk at the suggestion of a walk. They may cry, jump, and twirl around in anticipation. If your dog does this every time you grab the leash, give your dog the “sit” command and wait for them to sit before you even hook up the leash. If they refuse to sit, put the leash away. Take a seat and wait a few minutes before starting again. Keep doing this until your dog sits, and be sure to give them lots of praise for doing the right thing as you hook the leash on them. If they start getting wiggly and excited as you are hooking on the leash, pause, give the sit command, and then try again. This can be frustrating for both you and your pup, but if you stick with it, it will make going out for walks a lot less hectic. Ideally, your dog is not pulling or lagging while you are walking them. To make sure they are always walking at your pace, you can use one of these four methods to keep your dog well-behaved. You may find that one method works better than the other for both you and your dog, but don’t give up on one just because it doesn’t work the very first time. Try them out for a while and use whichever works best. Start by walking your normal route. As soon as your dog starts to pull, stop walking and wait. Your dog will may continue to pull, but stay put until the leash goes slack. Call the dog back to you and give the sit command. If they sit, give them a reward and praise them. Use a simple command such as “heel” or “go” and continue walking. If they walk with the leash loose, give them another treat and constant praise. If they pull on the leash again, repeat the process of stop, call-back, sit, treat, and praise, then continue on the walk. Be sure to reward your dog when they walk loose leash. Again, it is highly unlikely you will see results in the first day, or even the first week or so. If you are consistent with this type of training, your dog will learn two things: first, when they stay close and walk with a loose leash, they get treats, and second, if they pull on the leash, they have to stop walking and return to sit before they continue. 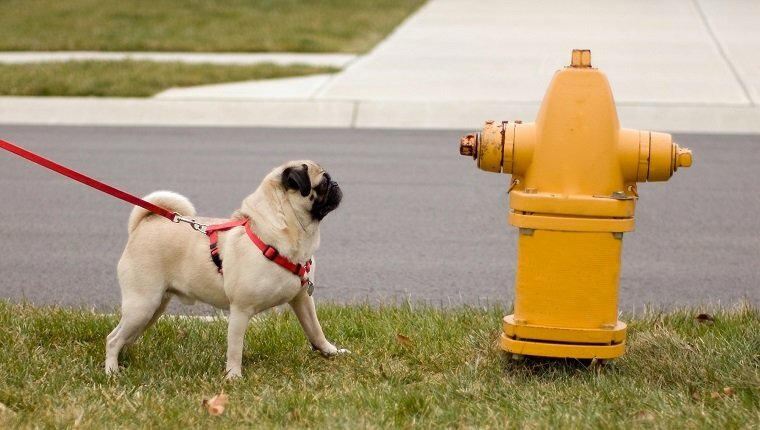 If your dog is pulling to get to an object or to go potty, follow the same rules. Then, after she returns and sits, you can give a command like “release” to let them go sniff. Be sure to give them enough slack so they don’t have to pull on the leash to go to the spot. Method 2: Give Your Dog Lots Of Treats! If your dog responds well to food-based rewards, this may be the system for you. This method works on the idea that what you have–a handful of treats–is much better than anything worth tugging the leash for. Start by showing your pup you have a handful of treats. Let them sniff your hand so they know exactly where the treats are. Give your dog the walk command, and then every few steps, reward them with praise and treats for walking with a loose leash. If they start to pull, follow the steps in the first method: stop, call them back, and command them to sit. Show them the treats again and resume the walk. If they jump up and try to get treats, say “ah, ah, ah,” and put your hand close to your chest, signaling for them to settle down. Once they do, command them to sit, show the treats again, and start walking. Once you’re on track, give them treats every few steps once again. Gradually spread out the time and distance between treats as they start to understand the lesson. 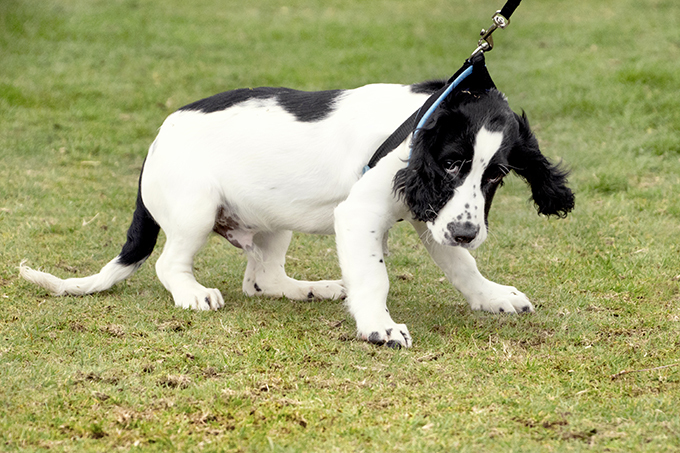 When dogs walk, they tend to concentrate on moving forward, except when sniffing or going potty. For some dogs, stopping, treats, and praise just won’t stifle that instinct to keep moving, and they will continue to pull regardless. Method 3 denies them that urge as you make sudden u-turns. You will need to begin with a warning. If you notice your dog about to pull, before they get to the end of the leash, give the warning command of “easy” or “slow.” When they obey, offer praise, call them back, reward them with a treat, and resume. When they don’t obey, say nothing, turn around, and walk in the opposite direction. If your dog comes to you willingly, praise and reward them, then turn and walk in the original direction. If not, stop, call them back, and command them to sit. Then turn and walk in the original direction. If they go back to pulling, turn around again. The learning here is that when your dog pulls, they get a leash check and no longer get to move forward. This is frustrating for them and they will eventually put two and two together. Give constant praise and rewards when they walk with a loose leash as necessary. NOTE: If your dog is running, a sudden turn and leash-check could cause serious injury to your dog–and you! The idea is to surprise your dog with the turn, not harm them, so use this method judiciously. Some dogs may be so used to having their own way on a walk that they resist these forms of training. In these cases, a sharp jerk and release of the leash may help. As with Method 3, it is important to give a warning to try to control your dog first. When you notice your dog about to pull, give the warning command of “easy” or “slow” before they get to the end of the leash. If they obey, always praise them, call them back, and then reward them before continuing. If not, use the command “easy” again; hold the end of the leash in one hand, and with the other, grab the leash up several inches and give a sharp jerk and release. The power of your jerk will depend on the size and strength of your dog–Perky Pomeranians obviously won’t need as much of a yank as a Doberman. The idea is to get your dog’s attention, not pull her back to you, so be sure it is a jerk and release. You may need to repeat this two or three times before they slow down or walk back to you. Use plenty of praise and rewards when they obey. After several days, you should be able to switch to Methods 1 or 2. NOTE: As with Method 3, an overly powerful jerk could cause injury to your dog. A dog’s trachea is vulnerable to bruising, so be sure to use this method responsibly–ideally with a harness–and switch to Methods 1 or 2 when they begin to obey. What If My Dog Doesn’t Like To Walk? Some dogs resist walking altogether. They stop, sit, and refuse to budge or even turn back toward home. This is often related to fear and anxiety over the sounds and sights they encounter, and you will need to address this before you will be able to get them comfortable on a leash. Start by simply getting them outside the home; try sitting on a bench in the park or finding a quieter spot to start the training, such as a residential street rather than a busier road. Begin slowly, using treats and praise to lure them along. Keep your first sessions short, going down to the end of the block and back; then gradually increase the length of the walk. Use parts of Method 1 to help distract your dog from the noises and sights. Call them to you, give the sit command and then reward and praise them as you walk along. This will help keep your dog focused on you and not the environment around them. With leash training, remember that consistency is key. It may be frustrating the first couple of weeks as you train or retrain your dog how to properly walk on a leash. If you stick to a training method, the results will come. Have you ever had trouble getting a dog to walk calmly on a leash? What advice do you have for people trying to train their dogs to walk nicely? Let us know in the comments below!